Like many people of color, James Blake has experienced the effects of racism firsthand — publicly — first at the U.S. Open, and then in front of his hotel on a busy Manhattan street, where he was tackled and handcuffed by a police officer in a case of “mistaken identity.” Though rage would have been justified, Blake faced both incidents with dignity and aplomb. Athletes have long been at the forefront of social change. These are their stories. In August 2015, American tennis star James Blake was standing on a busy Manhattan sidewalk and preparing to head to the US Open when he was tackled and handcuffed by a police officer in a case of “mistaken identity.” Though rage would have been justified, Blake faced the incident with dignity, using it as an opportunity to raise awareness about the dangers of racial profiling. 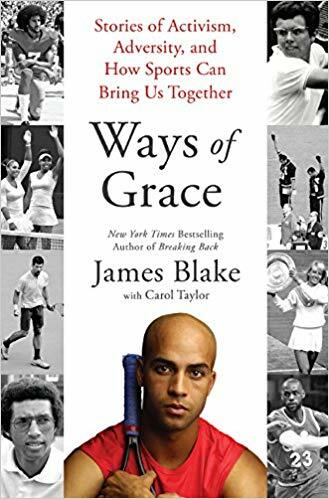 In Ways of Grace, Blake reflects on his experiences and explores how other sports figures have used their public roles not only to overcome adversity but also to advocate for broader social justice—even when it means risking the loss of fans, sponsors, teammates, or the freedom to compete. Discussing stories ranging from those of former Minnesota Vikings punter Chris Kluwe, who spoke out in favor of gay marriage; to Billie Jean King, who famously became the champion for women everywhere when she won the “Battle of the Sexes”; to the hard-fought journeys of Serena and Venus Williams to achieve equal pay for women in professional tennis, Blake uncovers how athletes from across the globe have used sports to unite rather than to divide. Weaving together these and other poignant stories, he also goes beyond the well-known names from sports history to reveal the important contributions from athletes seemingly forgotten, people such as Peter Norman, the Australian sprinter and 1968 Olympic 200-meter silver medalist, who stood in solidarity with Tommie Smith and John Carlos during the controversial medal ceremony and paid the price for his display back home. The result is a moving examination of how athletes have used their successes to further dialogue about our most pressing issues, despite the risks that have often accompanied that self-expression. Perfectly poised for our current political moment, a time when sports stars are leading the charge to preserve a diverse and tolerant world, Ways of Grace offers an urgent meditation on the rich history of athletics and activism, providing a profound testament to how the most difficult challenge for athletes frequently is not winning on the court, but standing up for their beliefs off of it. Tell us what do you think about Ways of Grace: Stories of Activism, Adversity, and How Sports Can Bring Us Together.